Birthday parties with friends is basically every child’s dream and frankly a nightmare for many parents. I have good friends who never do a friend party all the way to friends who do friend parties every year. There is no one right or wrong way to do parties–just what is right or wrong for your family. Here are some tips to get you thinking about what you want to do. Every year. The child can choose either a party at home with friends or to invite one friend to go out and do something “bigger”–like going to a movie or something. Have parties at milestone birthdays. “Milestone” is whatever you make of it. Some do 1 and 5. Some do 8 and 16. Some do 5, 8, and 12. Some do 6, 8, 12, and 16. Those are just some examples–a milestone year is whatever you think it is. Are you wondering what my policy is? So am I! Seriously–my husband and I have never settled on an exact plan. I see merit to all plans and like almost all of them. My husband’s opinions change. A year ago, he thought we should do it every year and didn’t think it was a big deal (but I pointed out he wasn’t the one planning the parties). This year, he thinks it shouldn’t be every year. I love the every other year thing, but my three older kids are pretty on top of each other so far as when they fall in the year, and they are also all two years apart, so if we did “even” years, then I would still be having three birthdays right in a row to plan. I worry about forgetting who is up if we did it off-set. I like the milestone idea fine, but I think we are more of the type to do parties more frequently than many people do in the milestone plan. I don’t even mind the random thing–it makes sense to base it on what is going on at the time and if it makes sense that year for you, but I worry about “squeaky wheel” thing happening–I have some children who would push for a party and some who would politely wait for their turn and get looked over. I really like the idea of offering a friend party or a fun activity. 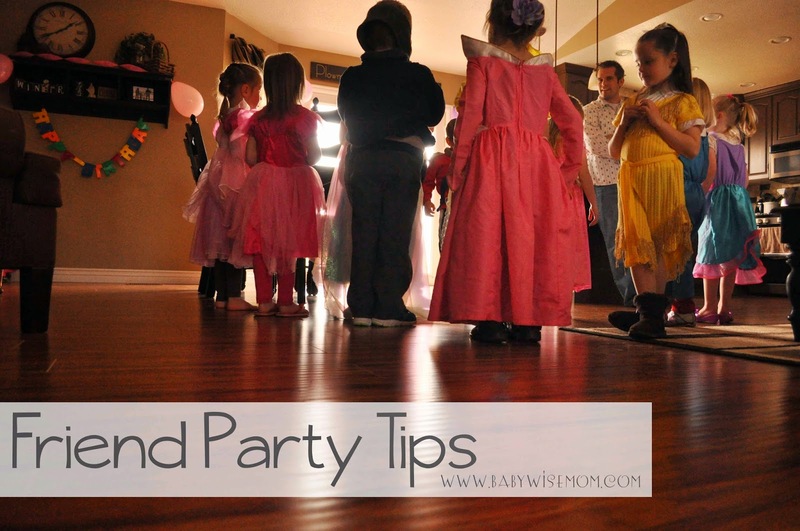 I think that allows children who aren’t party people the chance to celebrate in a fun way without being uncomfortable in a party setting (all of my children so far love parties, but I know some children are shy). The trouble I see with this is how do you choose just one friend? So far, one policy we have set firmly is that friend parties do not start until age 5. I find that age to be the age the children are able to participate in games and listen well enough that it isn’t usually super stressful. We do not do a party at age 6. We just never have. Brayden had a party at 7 and we are planning on doing the same for Kaitlyn. Now, age 8 is a big birthday for us being Mormon. That is the age the child is baptized if they choose to be. Because of that, we decided to do a friend party at 8 also. But then we realized, that doesn’t make a lot of sense. Then we are planning a party with friends as well as planning a baptism and hosting the family that comes to that. So it is a lot going on all at once. Brayden is one of my “squeaky” children who loves to have parties and he wants one as a 9 year old, also. We haven’t decided if he will or not. The length of your party will depend on what activities you plan to include. As I have asked around, most people have it be 1.5-2 hours long. Some go longer. For age 5, I like 1.5. When Kaitlyn turned 5, we did 2 hours and at the 1.5 hour point a little girl said, “This is a really long party.” My husband and I felt that too! For McKenna’s birthday turning 5, we did 1.5 hours and that was perfect. For age 8, we did 2 hours and that worked out well. You don’t have to have a theme, but I find it makes the party planning much easier. With Pinterest around, this is so much easier than it has ever been. I always go with whatever my child is the most interested in at the time. Brayden has done Indiana Jones, Star Wars, and Nerf. Kaitlyn did Cowgirl and will do Animal Safari. McKenna did Princesses. See my Birthday Parties board here. Talk to your child about who he wants to invite. Brayden often wants to keep his parties smaller. McKenna and Kaitlyn have to be kept in some parameters. With them I have them choose if they will be going with friends from church or friends from school (and some overlap). We usually keep it to 12 or fewer. Once you have your theme and have an idea for how many children you want to invite, you can choose your activities. We have found that some sort of scavenger hunt keeps the children focused an interested in the activities. We do a clue that leads to an activity, and then once the activity is over, they get the next clue. They have some overall problem they are trying to solve (searching for treasure or a lost slipper). For Kaitlyn’s 5th, we just had different cowgirl-related activities and that didn’t keep the children as engaged as the scavenger hunts have been. For Brayden’s Star Wars party, my husband set up an obstacle course in the backyard and did “Jedi Training.” So each activity helped them learn to be a Jedi. 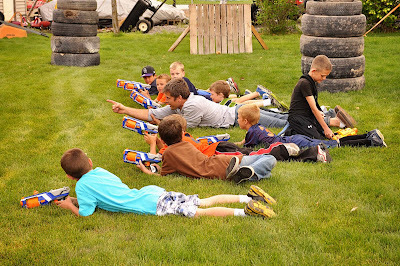 For his Nerf party, they did shooting training and then split into teams and had a Nerf war. Be sure whatever you plan, you have an ability to do it inside or outside. For almost every party we have had, it has rained. Oh, and of course, Pinterest is a great resource for this, also. Choose a cake to make and the decorations you want. Just a little tip–young children don’t pay much attention to the details adults put into decorations for parties. I do not put much time, effort, or money into decorations. The kids just don’t appreciate and it creates busy work for you. If you enjoy such things and it brings you joy, go for it! But please don’t feel like you have to go to great lengths just because Pinterst parties are full of those efforts. For cake, I like cupcakes for friend parties. They are easy to distribute and eat. You can buy invitations at the store or from Oriental Trading (or places like Etsy or Shutterfly). You can also print something up on your computer or make them by hand. I like to deliver invitations just over one week early. Two weeks can be good. You don’t want it so early that people forget. You also don’t want it so close that people have other plans. I like just over one week because I am the type who does errands on a certain day every week. It is challenging to me to get an invitation a few days before a party and have to make a special trip to buy a present. So I do it just over a week to give people time to go shopping. Side note: I have friends who stock up on gifts so they don’t have to go shopping. I think this is a great idea. For some reason, I can’t bring myself to do it. I think it is because I get satisfaction out of choosing gifts specific to people. Not all regions have party favors, but where I live, people do party favors to send home with the guests. I always choose something that is in the theme of the party. I also never do a bag full of dollar store toys. For Indiana Jones, we were able to find some Safari Hats from Oriental Trading. For Cowgirls, we got cowboy hats and bandanas from Oriental Trading. For Star Wars, it was a light saber. For the princess party, we did a wand and bubbles. For the Nerf party, we did Nerf guns. This was an expensive one, but we needed kids to have Nerf guns for the party to work and it was a special birthday. An alternative is to go somewhere! Many places have birthday packages. Bowling, laser tag, trampoline houses, gymnastics gyms, swimming pools, ice skating arenas…by the time you buy cups, plates, napkins, decorations, invitations, party favors, cake, etc. it is can often be about the same price to go somewhere as it is to have it at home. You pay a little more, but you don’t have to prepare your house or clean up after it. My good friend Serra offered to take pictures at McKenna’s birthday party. It was so great! I hadn’t ever thought to have someone be dedicated to it, but it is brilliant. There are so many things I have missed at other parties because I have been managing the party. But having someone whose sole focus in to take photos is a great way to capture many special moments. You can ask a friend, neighbor, aunt, grandma…etc. So there are my tips so far! Do you have any tips? What is your friend party policy? You can follow the ladies in the Babywise Friendly Networked Blogs on Pinterest. See our favorite party ideas here: http://www.pinterest.com/bfbnnetwork/birthdays-and-parties/ We are all blogging on birthdays today! Laura thanks for sharing! It is interesting to hear how parties are done in different parts of the country.